During Easter week we will be RIDING THE RAINBOW - a 260+ mile Charity Bike Ride from Warwick Hospital to Salcombe beach in memory of our precious baby grandson, Jasper. You can follow us on Twitter and Facebook and read our story via the sponsorship page on. Sunday 3 June, over 1,000 vessels participated in the largest flotilla ever seen on the Thames from Battersea to Tower Bridge to celebrate the Queen’s Diamond Jubilee. 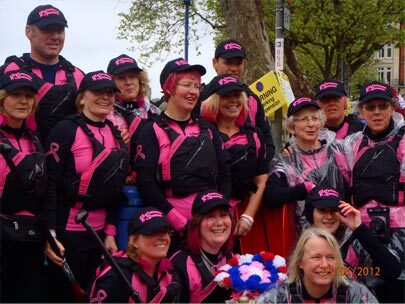 TML FOOD joined in the Celebrations in London in support of the Worcester Busters Dragon Boat crew, a group of very brave and courageous women who have survived Breast Cancer. Battling against the relentless rain and chilly winds these lovely ladies in pink paddled with grit and determination to complete the 7 miles course. TML Food auditors update their BRC training to encompass the recently changed BRC Issue 6. TML Auditors now fully accomplished in egg laying industry encompassing breeder and layer farms, packing stations and related feedmills and hatcheries. TML consultants, with years of hands-on experience in UK turkey production, ensure European processors meet the high demands of the UK retail market.